The vast majority of synthetic drugs are white powders. A reagent test kit is the only way you can safely attempt to verify the identity of a substance without expensive and complicated lab equipment. This article is an introduction to the various kinds of common test kits including a variety of worldwide sources. It should be noted that these test kits cannot measure the purity of a drug, only its presence. If you've got more than one drug in a powder, it's possible that a reagent test may show the presence of only one of the drugs. 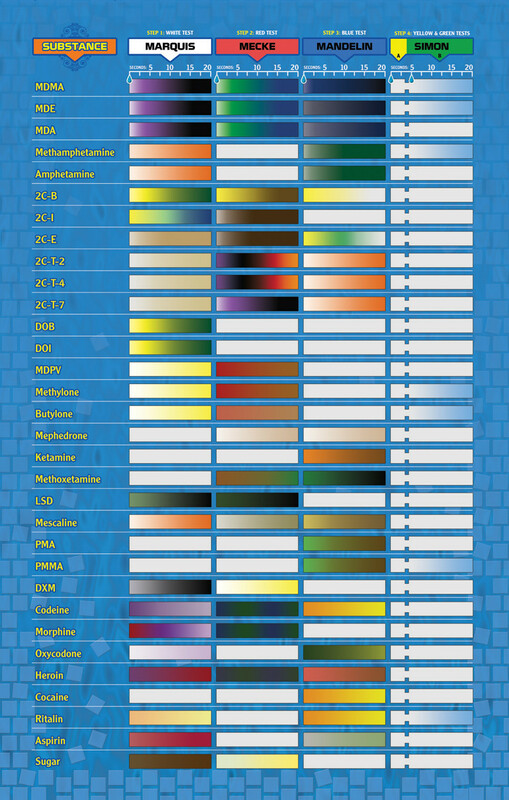 A color change reference chart for the four main reagents can be found at Dancesafe (Imgur mirror). Erowid.org also has a great Ecstasy Testing Kit FAQ. United Nations Office on Drugs and Crime Field and laboratory tests results for raw and prepared opium. Marquis' reagent is used as a simple spot-test to presumptively identify alkaloids as well as other compounds. It is composed of a mixture of formaldehyde and concentrated sulfuric acid, which is dripped onto the substance being tested. The United States Department of Justice method for producing the reagent is the addition of 100 mL of concentrated (95–98%) sulfuric acid to 5 mL of 40% formaldehyde. Use 'tripsitwiki' for 10% off reagent test kits! The Mandelin reagent is used as a simple spot-test to presumptively identify alkaloids as well as other compounds. It is composed of a mixture of ammonium metavanadate and concentrated sulfuric acid. Its primary use is for the detection of ketamine and PMA. The United States Department of Justice method for producing the reagent is the addition of 100 mL of concentrated (95–98%) sulfuric acid to 1 g of ammonium vanadate. The Mecke reagent is used as a simple spot-test to presumptively identify alkaloids as well as other compounds. It is composed of a mixture of selenious acid and concentrated sulfuric acid, which is dripped onto the substance being tested. The United States Department of Justice method for producing the reagent is the addition of 100 mL of concentrated (95-98%) sulfuric acid to 1 g of selenious acid. The Ehrlich's reagent is used as a simple spot-test to presumptively identify alkaloids. It is prepared by dissolving 0.5-2.0 g of p–dimethylaminobenzaldehyde (DMAB) in 50 mL of 95% ethanol and 50 mL of concentrated hydrochloric acid. It is best prepared fresh.